Then came the long hunt for a singer. Those ‘bizarre parameters’ include complex arrangements, unusual time signatures, and the technical fireworks of the group’s experienced players. The band sought a balance of complexity and accessibility on Broken Lines. Griffin said with a laugh, “There are moments where we’re kinda sneaking some smart stuff past the average listener because they can nod their head and dance to it and not know that they’re groovin’ in 13/8 or whatever.” Having toured with Dweezil Zappa’s band for years, Griffin is no stranger to challenging arrangements, and prides himself on being the ‘glue’ that can transform a complex song structure into a crowd pleaser. Griffin praised DuVall’s ability to elevate the songs. “He really found a way to find hooks,” he said. “To find catchy choruses…. He’s actually found a way to bring it into something a little more accessible to the average listener. Suddenly, we’re not just a ‘musician band’ anymore. We might actually get girls at our shows, and not just nerdy guitar player guys!” Pete will find out for sure this winter; Giraffe Tongue Orchestra has announced eight live performances (see giraffetongueorchestra.com for tickets) in November and December. 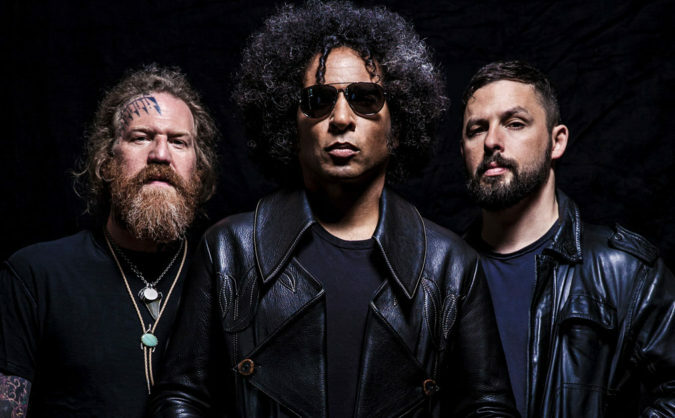 Giraffe Tongue Orchestra’s new album Broken Lines drops this Friday via Party Smasher Inc.